So the bottom line is, as a Boston boy, I don’t know New York’s Bridges. Well, except maybe the Brooklyn Bridge. Its been photographed as much as any other structure in this world. I should be able to recognize it as easily as I do the Eiffel Tower, or Roman Colosseum. So when I was there, shooting the Brooklyn Bridge a few weeks ago and saw this beast right next to it, I had to ask its name. Such is the nature of friendships among photographers from rival cities. Anyway, I hope you like the shot. A long exposure, high key treatment of the Brooklyn Bridge’s younger sibling. Awesome shot…that’s a great spot to shoot the bridges and lower Manhattan! Love the effect on the water and how you can see the Brooklyn Bridge too. His response was classic…haha. Really dig this treatment Bob – have a similar shot myself from that night (think all of us do haha) so I really like the way you processed it. And yeah, I’d actually wager to say that is a direct quote from Brian. Cool processing Bob! The blown out sky really highlights the bridge. Your photo proves that I never get tired of seeing this iconic structure. Love the angle, strong contrast and long exposure. Great image, Bob! Love your shot, Bob. That reflection in the water is just killing. Loving the long exposure – do you use Singh Ray ND? PS brian sounds like a perfect NY gentleman! Great shot! Love the processing. Great shot, Bob! And way to keep one of those NYers who think the whole world revolves around their city in line! While I’ve probably seen photos of that bridge in my life, I’m pretty sure I’ve never before been aware of the existence of any structure called the Manhattan Bridge (or the Manhattan f’ing Bridge, either). Sweet shot! The long exp and blown out lights is awesome. 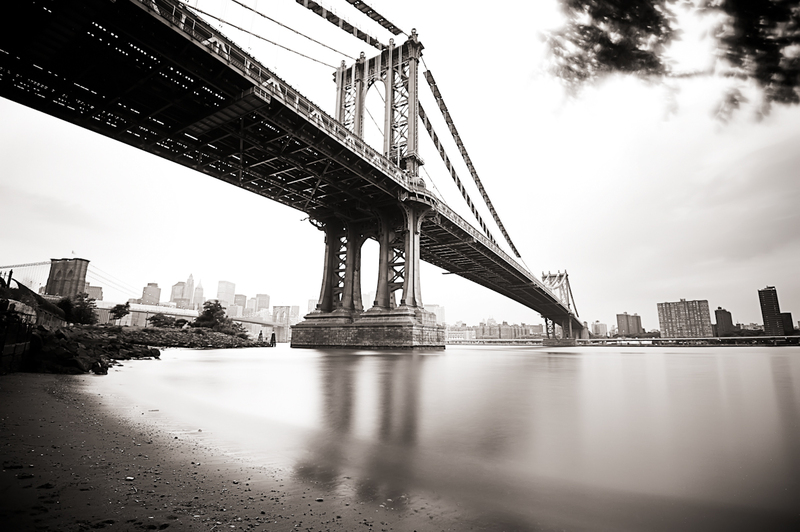 You’re not the only one that’s never heard of the Manhattan Bridge…who knew? Better yet, who cares :)? Really cool shot, Bob. Love the composition and the treatment! Just as well I didn’t ask about who plays at Fenway Park when I was up there with you guys last year! 🙂 Nice shot, by the way. Awesome shot! Love the treatment! Great shot, Bob! I’m diggin the treatment on that sky! Just great! I have seen that Bridge many times but i swear i have never ever seen it with this kind of perception before.A great great great job done man,i always admire and praise good photographers,and now you are in my that list.long exposure with sky in the frame is just looking awesome.